Environ Intensive Avance DFP 312™ was recently announced as the best anti-ageing product at the 2016 SA Elle Beauty Awards. This award-winning product is now available online at ConceptSkincare. Environ Intensive Avance DFP 312™ was recently named best anti-ageing product at the 2016 SA Elle Beauty Awards. This industry accolade honours the most-loved local & international beauty products and is selected by the beauty editors of the 46 editions of the magazine. As the leading independent online retailer of Environ skincare products - Environ Intensive Avance has fast become one of ConceptSkincare's top online sellers. This intensive anti-ageing cream features a scientific formulation of three powerful super-smart peptide complexes that have been identified as essential ingredients in the most advanced skin care solutions. This luxurious multi-functional moisturiser assists not only in improving the complexion, tone and texture of the skin, but also leaves skin feeling noticeably smoother and firmer - giving your skin that much needed radiant glow. Ultimately, this powerful peptide complex will help keep your skin looking its very best for longer. The Environ Avance DFP 312 Cream may be used both morning and evening - as well as in conjunction with your Environ AVST / Ionzyme C-Quence or Environ Original series products. ConceptSkincare has helped an untold number of Environ skin care users around the world obtain the best possible prices on what is undoubtedly one of the most effective skincare ranges in the industry - as this most recent "Best Anti-Ageing" award attests. As the leading independent online retailer of Environ skin care, ConceptSkincare bypasses the middleman & passes on the savings directly to its clients. 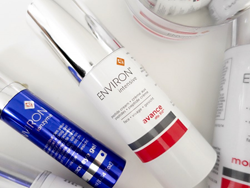 Environ skincare is a favorite amongst those in the know - acclaimed by dermatalogists, doctors, beauty editors and top celebrities alike - it is range underpinned by solid scientific advances.